Your Tbilisi guide and driver will meet you at 9 am at the lobby of your Hotel to start the journey to the Georgia’s ancient capital town called Mtskheta. This one day tour program will start with the drive to the legendary and beautiful Jvari Monastery – one of the major symbols of the Christianity in Georgia. Jvari is located on top of the mountain from where opens an amazing view over the Mtkvari and Aragvi rivers conjunction, as well as Mtskheta itself. 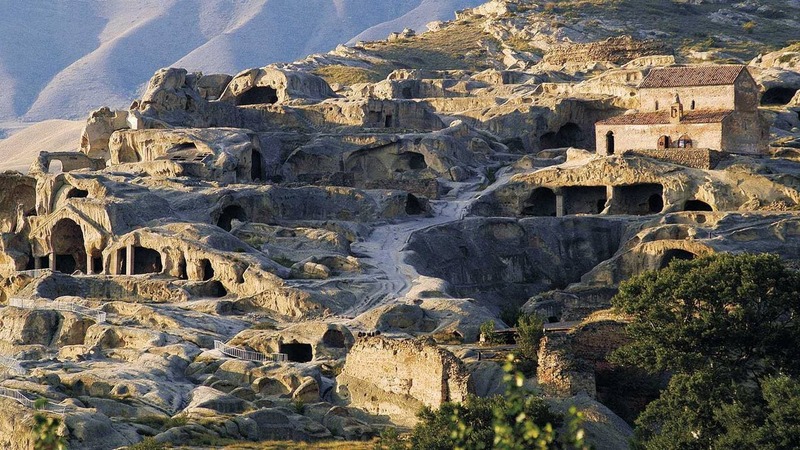 Next site to visit is called Uplistsikhe – centuries old “cave town” that still houses up to 150 big and small caves (out of 700 that used to comprise this ancient settlement), remains of old pagan altars, wine cellars and up to date operating Church. After lunch in the town of Gori you will visit the Goristsikhe – remains of the ancient fortress that stands on a high hill right in the middle of the town. If time permits you can pay a visit to the State Museum dedicated to Joseph Stalin. Next stop is Mtskheta itself, and its major site – Svetitskhoveli Church.